Former lightweight champ Benson Henderson (21-3) continues to surge up the ladder for a rematch against Anthony Pettis for the belt after defeating Rustam Khabilov (17-2) on this night. Henderson pushed forward in the entire bout, got taken down many times, but it was him who got the submission finish in the end. Khabilov got to a good a start, scoring two take downs and landing some pretty good shots, especially the one time where Khabilov countered Henderson’s forward punch by spinning off from the fence and hitting him with an elbow (cool-looking move!). Khabilov got another takedown in the second round but Henderson pushed off and got back to his feet almost immediately. Henderson showcased his experience by taking Khabilov’s back from standing position almost effortlessly, which Khabilov failed to do on his attempt in the first round, but Khabilov managed to turn around into Henderson’s guard and got back to his feet. Both scored some significant strikes here and there but nothing big. In round 3, Khabilov caught Henderson’s kick and got him to the ground with ease to attempt a headlock from sprawl position but gave up on that eventually, landing a knee to the body before getting back up. Later on, Khabilov timed a perfect takedown, this time landed right into Henderson’s guard but again, Henderson pushed Khabilov off with ease, pulled a leg and reversed to top position. Impressive ground move, that one, but not enough time remaining in the round for him to do anything more. In the fourth round, Khabilov didn’t show any sign of slowing down despite his lack of experience in championship rounds, great conditioning but Henderson continued to move forward. Khabilov got caught but an uppercut-punch combo which allowed Henderson to get one hook in, jumped right on the back and applied a deep rear naked choke. Khabilov had no choice but to tap. New Mexican Diego Sanchez (25-7) have gotten a very controversial split decision win against Ross Pearson (15-7) in the co-main event, and I’m sure I’m not the only one who’d disagree with this decision. I’d give the first round to Sanchez for being more aggressive and throwing my combination, the second round obviously went to Pearson for dictating the pace, pushing forward, landing more significant strikes and dropping Sanchez thrice, and Pearson carried his momentum into the final round where, although Sanchez pursued more, it was Pearson who seemed to have connected with more strikes. And yet somehow one of the judges dared to give Sanchez a 30-27 score, which meant that he/she thought that Sanchez won all three rounds. What a bias, bias, decision by two of the judges for the hometown boy Sanchez. Pearson clearly won this bout. Even the commentators were shocked, adding that the judges “should be ashamed of themselves”. In the bout between two top flyweight contenders, it was a pretty boring fight until John Dodson (16-6) landed a brutal knee to John Moraga‘s (14-3) nose and broken it bad enough that the blood couldn’t stop flowing out, forcing the doctor to stop the contest during the break between round 2 and 3. 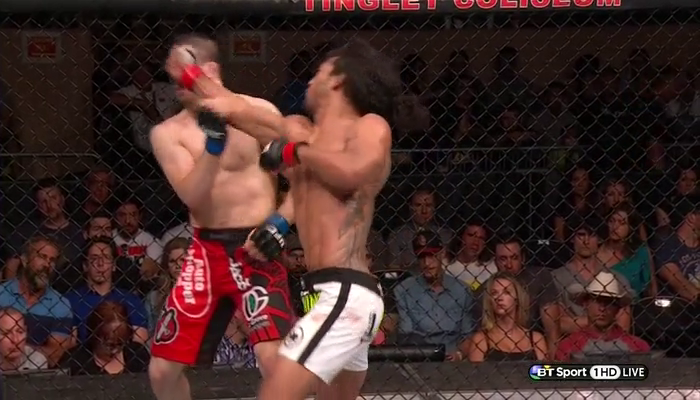 Moraga probably thought Dodson was going for a high kick so he bent over to dodge it but ate a knee to the face instead.